DALLAS – Jan. 14, 2018 – With those iconic, traffic-stopping Mary Kay pink Cadillacs rolling into Georgia along with more than 7,000 Mary Kay Independent Sales Directors, the city of Atlanta is turning from peach to pink for the beauty company’s annual U.S. Leadership Conference. The top beauty brand and direct seller in nearly 40 countries around the world kicks off the conference on Jan. 14 at the Georgia World Congress Center bringing $8.4 million in direct spending and an opportunity to give back to its host city. While the four-day event focuses on recognizing, educating and motivating leaders from across the country within Mary Kay’s independent sales force, attendees will also assemble 2,000 care kits to distribute to five Atlanta area domestic violence shelters: Forsyth County Family Haven, Gateway House, Partnership Against Domestic Violence, NOA’s Ark/No One Alone and Project Safe. 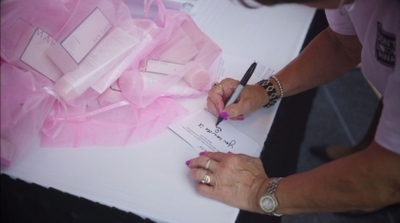 The care kits are filled with Mary Kay® basic hygiene products and offer a source of comfort to women at emergency shelters who often flee abusive situations with little personal belongings. Each year, Mary Kay holds its U.S. Leadership Conference in a different city. Independent Sales Directors and Independent National Sales Directors offer leadership and motivation to the growing Mary Kay independent sales force worldwide. According to the Atlanta Convention & Visitors Bureau, the 2018 conference will pump $8.4 million into the local economy. This marks the third time Mary Kay has held its annual Leadership Conference in Atlanta following events in 2006 and again in 2012. To date, Mary Kay Inc. and The Mary Kay Foundation℠ have donated $57 million to domestic violence prevention and awareness programs in an effort to end the cycle of abuse. For more information about Mary Kay’s commitment to end domestic violence visit marykay.com/dontlookaway.